Heme, a porphyrin, is a co-factor in haemoglobin, myoglobin, cytochrome, catalase, heme peroxidase, and endothelial nitric oxide synthase. It has a complex structure with four pyrrole rings with a ferrous iron in the centre that allows it to carry oxygen. The synthesis of heme takes place from glycine and succinyl CoA in eight steps and is extensively studied. Mutations in genes encoding for enzymes involved in heme synthesis result in porphyrias. Synthesis of δ-aminoleuvelinic acid: Synthesis of δ-aminoleuvelinic acid (ALA) from glycine and succnyl CoA catalysed by ALA synthase (ALAS) is the first step in the synthesis of heme. This is a rate limiting step. ALA synthase is encoded by two genes ALAS1 (OMIM 125290) and ALAS2 (OMIM 301300). ALAS2 codes for the erythroid ALAS and ALAS1 for the non-erythroid (housekeeping) ALAS. The gene ALAS1 is located on chromosome 3p21.1. The product has 12 exons and undergoes is alternate splicing to yield two distinct forms, isoform 1 (640 amino acids) and isoform 2 (657 amino acids). The erythroid specific gene (ALAS2) on X chromosome at Xp11.21. It has 12 exons and also undergo alternate splicing to yield two forms, isoform b (587 amino acids), isoform c (574 amino acids). ALAS is synthesised in the cytosol and transported to the mitochondria. It has a short half life. Heme synthesis is consoled by regulating levels and activity of ALAS (discussed below). Synthesis of prophobilinogen: ALA moves to the cytosol and is dimerised to prophobilinogen by the action of prophobilinogen synthase (ALA dehydratase). The enzyme is a homo-octomer (made of eight similar units) and needs zinc. The gene (gene ALAD, OMIM 125270) encoding the enzyme is located at 9q32. It has 15 exons. Four isoforms from alternate splicing 361 amino acid, 344 amino acid, 321 amino acid and 304 amino acid are known. Synthesis of hydroxymethylbilane: Prophobilinogen is converted to hydroxymethylbilane by the action of hydroxymethylbilane synthase. This enzyme is also known as propohbilinogen deaminase. The gene (HMBS OMIM 609806) is located at 11q23.3, has 15 exons. Four alternately spliced forms with 361, 344, 321 and 304 amino acids are known. Synthesis of uroporphyrinogen: Hydroxymethylbilane is converted to enzymatically to uroporphyrinogen III as well as non-enzymatically to uroporphyrinogen I. The enzymatic conversion is catalysed by the enzyme uroporphyrinogen III synthase. Uroporphyrinogen III synthatase is encoded by a gene (UROS, OMIM, 606938) on 10q25.2-q26 that has 16 exons and encodes for a 265 amino acid protein. Synthesis of corpoporphyrinogen III: Uroporphyrinogen III is decrboxylated to corpoporphyrinogen III by uroporphyrinogen decarboxylase. The gene (UROD, OMIM 613521) for thes enzyme is at 1p34. It has 10 exons and encodes for a protein 367 amino acid long. This is the last step in the cytosol. Synthesis of protoporphrinogern IX: Coproporphyrinogen III is converted to propoporphyrinogen IX by a reaction catalysed by corpoporphyrinogen oxidase in the mitochondria in an oxygen dependent reaction. The gene for corpoporphyrinogen oxidase (COPX, OMIM 612732) is at 3q11.2-q12.1 8 exons. The product has 454 amino acids. Synthesis of protoporphyrin IX: Propoporphyrin is the final product of the pathway into which iron is incorporated. Protoporphyrin IX is synthesised by the action of protoporphyrinogen oxidase. The gene (PPOX, OMIM 600923) for this enzyme is located at 1q22 and has14 exon. It encodes for a 477 amino acid enzyme. Synthesis of heme: Ferrochelatse (protoporphyrin ferrochelatase) catalysed the incorporation of iron into protoporphyrin IX. The gene (FECH, OMIM 612386) for ferrochelatse is located at 18q21.31 and has 11 exons. It encodes for a 477 amino acid enzyme. The rate limiting enzyme of heme synthesis is the synthesis of ALA. ALA synthase has a short half life. Heme synthesis is regulated by controlling the levels and activity of ALA synthase. Inhibition of ALA synthase: ALA synthase is subject to feedback inhibition by heme and and it’s oxidation product hemin. 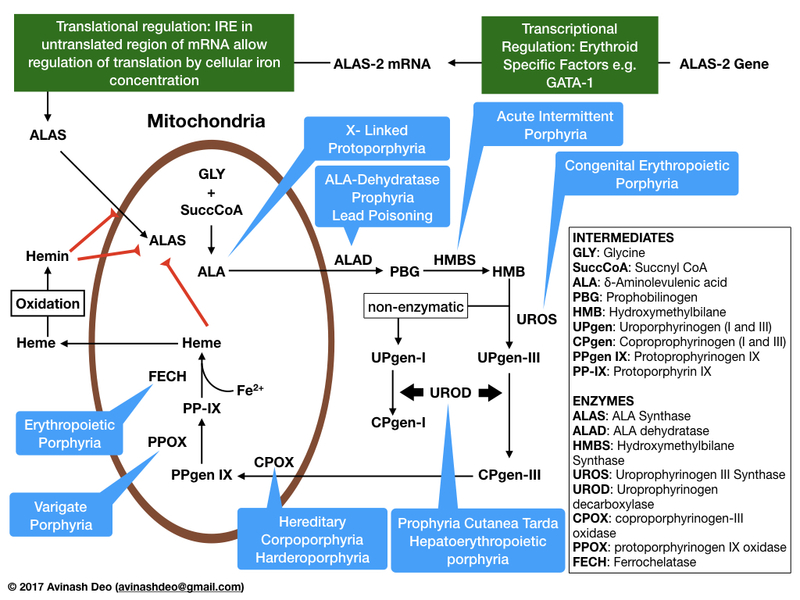 ALA synthase is synthesised in the cytosol and transported to the mitochondrial matrix. In addition to being an inhibitor of ALA synthase hemin also inhibits the metochondrial transport of the enzyme. Promotion of ALA synthase activity: Cellular iron and factors promoting erythroid differentiation increase the synthesis of ALAS-2, the enzyme responsible ALA synthesis in erythroid cells. Erythroid specific factors like GATA-1 promote the transcription of the ALAS-2 gene. Untranslated portions of the ALAS-2 mRNA have iron responsive elements (IRE) that promote translation. The activity of ASLS in iron deficient cells is low. ALA dehydratase: ALA dehydrate deficient porphyria (ADP). Lead displaces zinc from binding sites inhibiting the function of the with enzyme. In patients with tyrosinaemia type 1 Succinylacetone (4,6-dioxoheptanoic acid) accumulates in tyrosinaemia type I. It is structurally similar to ALA and a potent inhibitor of ALA dehydratase. Uroporphyrin decarboxylase deficiency results in porphyria cutanea tarde. All patients with porphyria cutanea trade do not have a mutation. Only type II has gene mutations. Types I and III are due to mulifactorial effects on the gene.